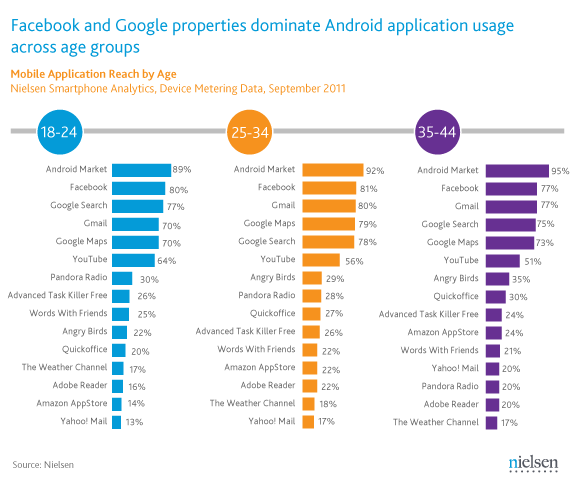 In Nielsen’s newest age-based report on app usage among Android users, you won’t find many surprises. Besides the pre-installed Android Market, Facebook is the most popular app with an overwhelming 80% statistic. Following Facebook, you will find Google apps, Angry Birds, and even Task Killers high up on the list. Task Killers? Haven’t these people read our site? Scrolling down the list we see that Words with Friends is highly popular among more mature Android users, and also that no person can go without The Weather Channel app. Does Nielson’s report reflect what your app list looks like? I have a feeling that Nielson would find more superuser apps if they surveyed Droid Life.